It is here on the beach of Hastings where William the Conqueror of Normandy landed his army in September 1066 to fight the English army under King Harold II three weeks later on the 14th October at the Battle of Hastings. The battle took place at Senlac Hill about 6 miles northwest of Hastings, close to the town of Battle. The shingle beach of the Old Town is known as The Stade, which is an old Saxon term meaning “landing place” has the biggest beach-launched fishing fleet in Britain. 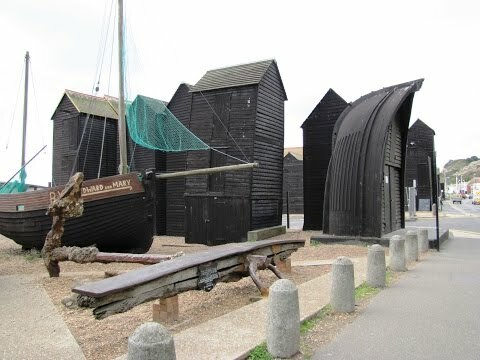 The Net Huts which stand on the beach are tall, slim black clinker wooden sheds of approximately 25 feet high and were built to provide weather-proof workshops and storage for the fishermen’s nets, sails and ropes. The nets were made from natural materials and would rot if exposed to water for too long. Some of the huts are old fishing boats that have been cut into two. The huts were originally built on posts to allow the sea to go underneath but over the years more shingle has built up so now the sea no longer reaches the huts. The small beach had limited space for each hut to be built so they had to build upwards to accommodate all the nets each boat had, some of them also have cellars. There are many fresh fish stalls and a fish market. The beach is also home to the miniature railway constructed in 1948. There are two museums one being the Old Town Museum which was once the town hall built in 1823 and the other being the Fishermen’s Museum which was once a church badly damaged in the 1950’s it was restored and reopened as a museum in 1956. The East Hill lift opened in 1902 and is the steepest funicular railway in the country with a 1 in 2.8 gradient and carries passengers up the cliff to the picturesque glens. All Saints Street has some of the oldest surviving medieval houses in Hastings dating from 1450 and situated at top end of the street is the All Saints Church built in 1436. Hastings Country Park covers an area of over 660 acres lying within the High Weald area of Outstanding Natural Beauty. Most of the park has been designated a Special Area of Conservation, a Site of Special Scientific Interest and is a proposed Nature Reserve. The park is full of wildlife, rare insects, cliff vegetation which is often diverse including rare plants, acid grassland, heath land, freshwater marshes and ancient gill woodlands. The park is also made up of areas, the Fire Hills which is the main car park and visitors centre, Warren Glen which was once farmed by Stone Age man, at Fairlight Glen there is The dripping Well where John Logie got his inspiration for inventing television, Ecclesbourne Glen which is heavily wooded with many ferns and mosses and was the landing place and entrance to an Iron Age Hill Fort, East Hill which is an important historical and archaeological site, The Helipad which is the Fairlight Road Picnic Site and North’s Seat which is the highest point above sea level in Hastings. From the mid 1600’s to the early 1800’s Taxes in England were so high on luxury goods such as tobacco, alcohol, tea, sugar, spices, leather, silk and jewellery that Smuggling became big business on the south coast. In the early 1600’s wool was in great demand abroad and was the biggest in the smuggling trade. Smuggling wool out of the country was called “Owling” and all smuggling often led to violence and murder. In the early 1700’s the demand for wool decreased but the smuggling of the more luxury goods into the country increased. Most of the smuggling took place on the East Sussex coast due to it being closer to France and Hastings was no exception. You can discover and explore Hastings smuggling past at the Smugglers Adventure in the St. Clements Caves deep in the West Hills. There is so much more to see and do in Hastings so why not visit this wonderful town. There are many more attractions in Hastings so give this wonderful town a visit and explore. First we would like to thank the people we met and spoke to on this walk for their knowledge and helpful ideas of the area, especially Jenny Boore with her little dog, a fun lady, who we had a very pleasant and interesting chat with. We park in the car park that overlooks the sea in the Old Town of Hastings. We walk down the little street towards the shops and take a look at the fishermen’s storage huts, the miniature railway and wander around the Old Town Museum. At the main road we take the small road, All Saints Street which runs parallel with the main road, on the right between Webs and the Neptune fish and chip shop. We walk forward slightly uphill passing All Saints Church on the right and then take the footpath on the right which goes steeply up a tarmac path through the trees. At the top of the we bear round to the left, pass a post box on the right and after 50 yards turn right onto Barley Lane, a one way road, then at the t-junction we head forward on the no through road and keep following the lane past the car park for Hastings Country Park, we are now on the 1066 Country Walk Hastings Link. We keep heading forward past the caravan and camp site until the track turns sharp left to a car park, picnic area and toilets we do not turn left but go straight forward through the gate in the trees onto a hedge lined narrow path, sign posted Fire Hills 1 mile. We keep heading forward on the path until we come to a track (if you turn left it will take you to Fairlight, the visitors centre, car park and toilets) we then turn right past some cottages and walk in front of the radar station and mast on our right and the Fire Hills area on our left, where there are some benches to sit and admire the breathtaking views. We now turn right and head towards the cliff edges taking the path to the left, going downhill. We now follow the coastal path, the Saxon Shore Way, going steeply up and down hill three times before we reach East Hill above the Old Town of Hastings. We walk over the large open field of East Hill and walk down the steep steps along side of the East Cliff Lift then follow the path down to the road and then turn left back to the car park. This is a moderate to hard walk with some steep inclines and declines especially along the coastal cliffs. Approx 6 miles using OS map 124. Hastings is in East Sussex on the south coast of England. From the M25 take junction 5 onto the A21 south for Tunbridge Wells and Hastings. In Hastings there are public toilets, pubs, restaurants, cafes and plenty of shops. There is ample parking with toilets nearby in the Old Town of Hastings. There is a car park at the Hastings Country Park and there is parking, toilets and picnic area on the road towards Fairlight and also parking and toilets at Fairlight Visitors Centre.